Oil and gas organizations need to optimize working capital, accelerate cash flow, and avoid losing valuable leases. 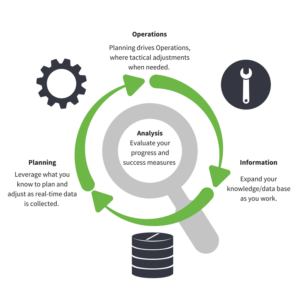 Meeting these goals is obviously complex, but each business objective can benefit from more efficient, optimized data. In an ideal world, Planning, Operations, and Information collection are iterative, where plans are created based on what is known. Operations executes the plan and collects real-time data. That data is then used to refine the plan and adjust operational activities. This cyclical process looks simple but, without the right solutions and process in place, it is highly challenging to implement. One key reason is most E&P companies have a constant data organization/synchronization battle. Information is often spread over disparate systems, from spreadsheets to file-shares to different point solutions. There’s plenty of data out there, but it’s hard to find, identify the conflicts, do the necessary data clean up and get them synced up. Schedulers must contend with data that’s duplicated, out of date, inconsistently named, and/or impossible to reconcile with related information from a different system. As a result, employee productivity goes down and operations are less efficient and effective. Management can’t get the information they need in a format they can digest, so measurement, reporting, and forecasting all suffer. What if you could do more with your data? 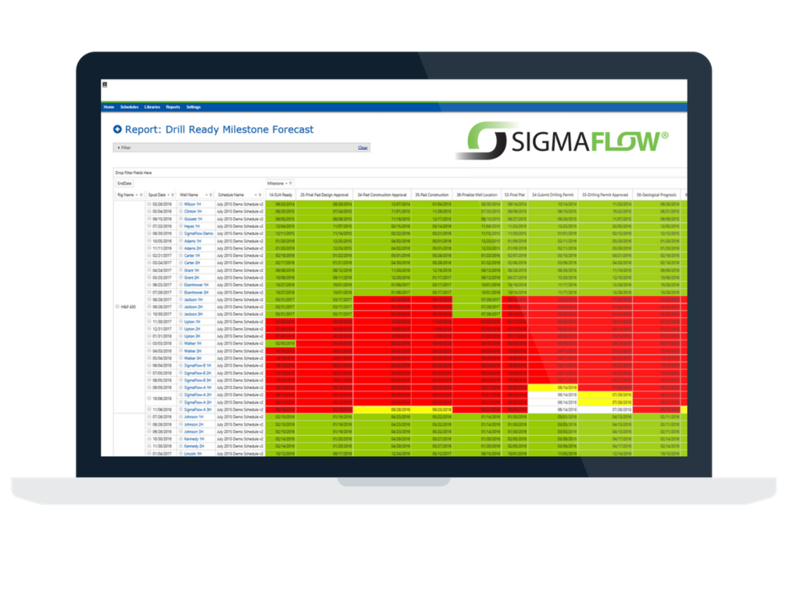 A well delivery solution like SigmaFlow allows you to integrate, measure, and report on your data across multiple systems, serving as a centralized hub that enables b etter decision making. 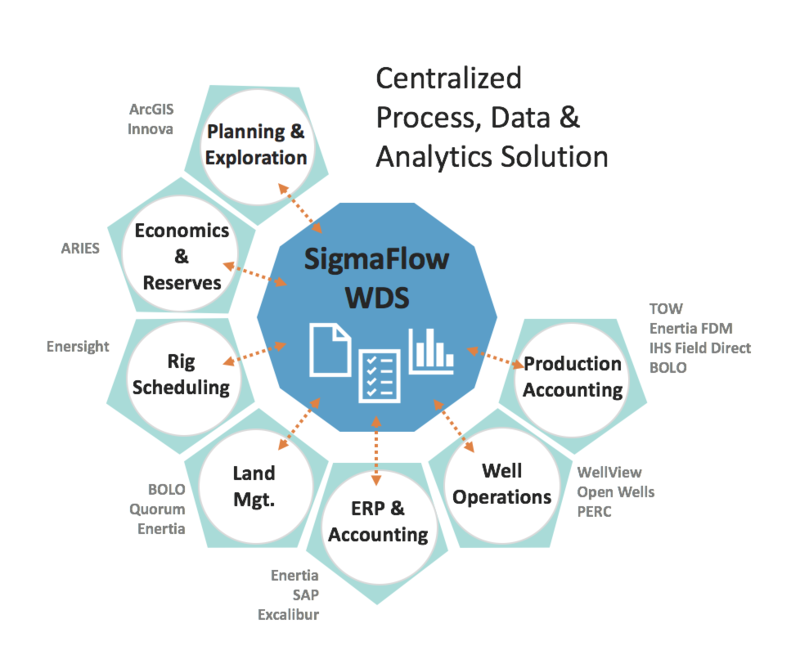 The system surfaces your well data and makes it easy for schedulers to create efficient, effective drill plans so that the business can meet its objectives around revenue and production. A well delivery solution adds much-needed transparency to the drilling schedule process. If your drill schedules are in Excel, your information is static. You’re rearranging when wells should be drilled. You need to personally remember all the contingencies around each well. You’re juggling lease contracts manually. You’re hoping that your scheduling plan is on point – but without a way to connect all the dots and track all the moving pieces, it’s probably not. SigmaFlow, in contrast, collects, monitors, and reacts to key well data. It gathers data within its own system and pulls data in from external systems via APIs, connectors, database integration, and file-based import. The solution identifies dependencies, triggers activities and workflows, generates analytics and more so that schedulers can clearly see if they’re going to meet their plan or if there is a better alternative, then adjust accordingly. Completing the well prior to its infrastructure. Reports and schedule alerts provide visibility into related pipeline and facility activities which are integral to determining when an asset will be ready for production. If the well is scheduled to be ready for production prior to the infrastructure, then the manager may want to redirect capital with wells that already have infrastructure in production. Avoiding sub-surface conflict. Reports and schedule alerts provide visibility into activities planned/forecasted for similar dates within a specified proximity that may introduce conflict. Avoiding continuous drilling default. SigmaFlow will alert you when the span between spud dates exceeds a specified number of days. Continuous drilling conflicts can be communicated as resource schedule exceptions and in reports. SigmaFlow’s well delivery solution doesn’t simply organize your documents and data – it’s smart, too. The system’s predictive scheduling features can create scheduling plans based on data points by considering the conditions that have to be met in the rigs that are being used. It factors in which rigs are available, which ones are out of service, the contingencies and stipulations of each region, continuous drilling obligations and more to build the best possible plan for your current circumstances. Using pre-defined, configurable calculations, it can automatically schedule simple to complex drilling activities and also schedule Fracking or other completions activities based on the projected drilling completion dates. The SigmaFlow solution offers efficiency, effectiveness, and reliability through process planning tools and automation. With the SigmaFlow solution, updated schedules automatically adjust active work, due dates, work priorities, assignments and the affected team members are notified. Not only does this provide operations with the tools to manage and track day-to-day work, it also provides the scheduler with a real-time view of work thus reducing the effort of collecting ‘true’ status in weekly meetings or other unstructured processes. This translates into real-time reports and dashboards that illustrate historical trending, current activity oversight and forecasting.